Kiwi can be divided into several functional parts. Beside the CPU itself a CPLD takes an central role in the overall functionality. It connects (glues) all parts by serving their control lines. The MC68008, which has been used in the Sinclair QL, is the 8-bit variant of the famous MC68000, that has been used in early Amigas, Macs and the Atari ST. According to the reduced databus width, the MC68008 has to do twice bus accesses in comparison to the MC68000. Motorola states 60% speed average compared at the same clock. The MC68008 usually works in an asynchronous mode, which means bus accesses can be extended or shortened for slower or faster devices. The latter is done via the the low active DTACK signal; an accessed device pulls this line down to ground when the cycle is complete. In a read cycle, DTACK should be grounded when the data on the bus are stable. In a write cycle, DTACK should be grounded when the data on the bus is taken. Motorola decided to give both, the MC68008 and the MC68000 a second, synchronous mode, which is supposed simplify the use of older MC6809 devices. Further signals include bus control for bus sharing with other bus masters (*BR and *BG) which is not used in Kiwi. There are three interrupt request inputs. These inputs represent the binary encoded interrupt level from 0 (no interrupt) to 7 (non maskerable interrupt, not used in Kiwi). The following table illustrates all CPU vectors. After power-on or a system reset, the CPU fetches the initial Program Counter and the Supervisor Stackpointer. These vectors are addressed at 0x000000 and 0x000004. Therefore, the CPU has to see ROM at these addresses. Unfortunately, it is very unpractical to have the whole exception table in ROM, since this would prevent changing vectors. The trick is to count the first bus accesses and overlay ROM just for the time the CPU needs to fetch both vectors. After fetching both vectors, the CPU accesses RAM at 0x000000. This method is described in Motorola App. Note 897 "MC68008 Minimum Configuration System". After Reset, all Qn-Outputs of the 74LS164 shift register are low, while the input is connected to a Pull-Up resistor. AS toggles with every single bus access. It takes eight (2*4 bytes) accesses to fetch both vectors. Every time AS goes low, the logic one is shifted one position. After eight accesses, the QH output changes from low to high. This signal (REROM) is used to overlay ROM at address 0x000000. This solution is transparent for the software. 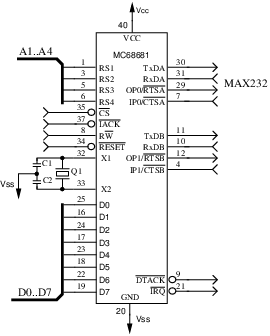 Memory Map The address decoding circuit is part of the CPLD XC95108. An 30 pin SIMM is used as main memory. These old DRAM modules have a databus width of 8 bit. Dynamic RAM has a couple of advantages against static RAM. It is smaller and cheaper than static RAM with the same capacity. The downside is that it is slightly more complex to use dynamic RAM. First the address bus is multiplexed. Meaning that one address line carries two address bit. 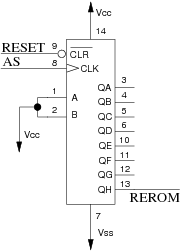 DRAM chips have two control signals to input either row address (RAS) or column address (CAS). On the other hand, DRAM cells need to be refreshed frequently. A DRAM cell is built around an transistor and a capacitor and as every capacitor has some leakage, the cell would loose its stored information after some time. To circumvent this difficulty, the capacitor has to be recharged (refreshed) within a certain period. Thus, all cells within the accessed row are refreshed at once every time the DRAM is accessed. Since every cell has to be refreshed, it is not sufficient to rely on ordinary CPU accesses. There are numerous refreshing techniques, where Kiwi uses CAS before RAS refresh only. In a normal memory cycle (read or write) the order of strobing in the address is "RAS goes low before CAS goes low". If CAS is grounded before RAS, the DRAM performs an automatic refresh cycle. It keeps track of the last refreshed row and refreshes the next. The MC68681 DUART has two serial interfaces. 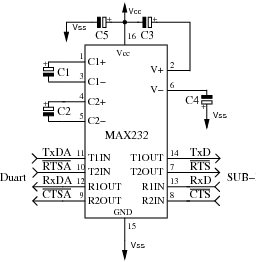 The first one is used in conjunction with an MAX232 to form an RS-232 interface. It is available via an DB9 connector. The second serial interface of the DUART is directly connected to the ATmega8. The latter samples both PS/2 ports and sends data to the DUART. The V9990 Video Display Processor (VDP) was a powerful device in its time. It was intended to be the next generation VDP for the MSX line of home computers. Unfortunately, it hit the market too late and the MSX TurboR was released with the older V9958 VDP. Thus, Yamaha looked for another market. They dropped the compatibility features for the MSX VDP and implemented two office screen modes - without much success. Except for the GFX9000 addon card for MSX, the V9990 was never commercially used. Despite its commercial flop, it has some nice and advanced features. Two pattern screen modes to support tile based games. Six different bitmap screen modes. Up to 640x480 display resolution. Up to 125 independent sprites in both pattern screen modes. Hardware Blitter with drawing functions. The VDP is directly connected to the system bus via its 8 bit databus and a number of control signals. These signals include read and write strobes, interrupt requests and a *WAIT which is used to slow down CPU accesses. Four 128kB dual port RAMs are used by the VDP exclusively which gives 512kB VRAM in total. The CPU accesses this RAM via registers of the VDP. The Video signal is output as RGB only. An CXA2075M RGB encoder is used to convert the video signal into S-Video and composite. The heart of the audio system is the Sound Interface Device (SID) which is known from the Commodore C64. Kiwi supports two SIDs; one for each channel to provide stereo audio. The SID has the following features (Wikipedia). one multi mode filter featuring low-pass, high-pass and band-pass outputs with 6 dB/oct (bandpass) or 12 dB/octave (lowpass/highpass) rolloff. three attack/decay/sustain/release (ADSR) volume controls, one for each audio oscillator. oscillator sync for each audio oscillator. During its lifetime, several revisions of the SID have been developed. In addition to some minor changes, there were some that affect the external circuit which includes a different supply voltage, as well as different filter capacitors. Kiwi has two jumpers to provide either 9 volt or 12 volt to each SID. Hence, a mixed SID operation is possible. The SID has been developed for the C64 which is an 6510 (6502) based computer. 6502 based systems are built around an synchronous bus system. To synchronize with the bus an Phi2 input is provided at pin 6. 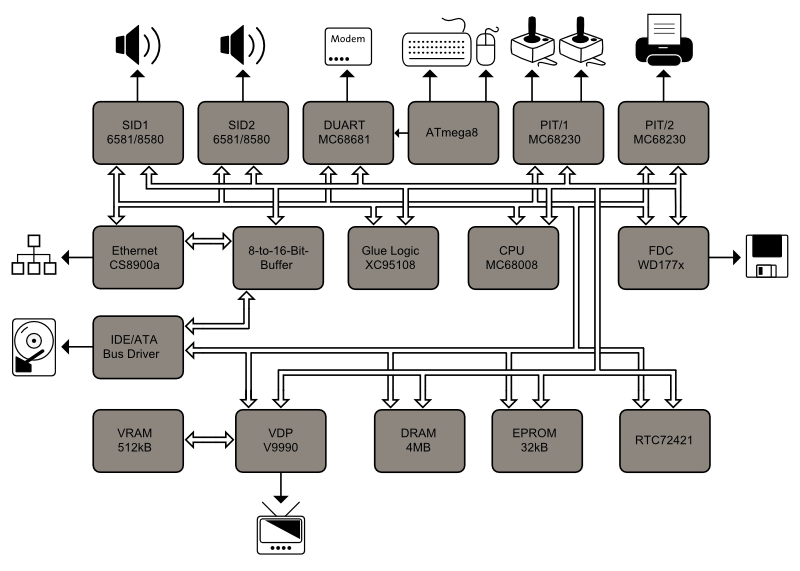 Phi2 is just the 6502 naming for the E equivalent of Motorola's MC6809 family. So pin 6 is directly connected to the E output of the MC68008. Two standard double density floppy disk drives can be used as mass storage in addition to the harddisk. Almost all neccessery signals are controlled by an Western Digital WD177x Floppy Disk Controller. But since the WD177x lacks some signals, those have to be controlled by using some lines of port B of the second PI/T. Port B is shared with the centronics interface. To improve signal integrity, almost all signals are actively driven by TTL drivers and terminated by series resistors. There are some minor issues with this circuit. The logic of the drive select and motor signals are not correct in the corresponding picture. While the CPU, memory and most of the subsystems are connected with 8 bit width, there are two subsystems which use a 16 bit bus. These are the ATA/IDE interface and the Ethernet interface (CS8900a). To access 16 bit with an 8 bit CPU, one has to break accesses. One 16 bit access works out as two consecutive 8 bit accesses. This works as follows. To read an 16 bit word, the device is accessed with the first access. While it provides its data, the lower half (D0-D7) is read by the CPU while the upper half (D8-D15) is latched (U44). The second access just enables the output buffer of this latch. To write an 16 bit word, the device is accessed with the second access. The data provided in the first access is latched (U45). With the next access, the latched data is provided as low byte (D0-D7), while the CPU data is provided as high byte (D8-D15). As the MC68008 always accesses low byte first, word addressing modes with 16 bit are possible. In this way, the address line A0 can be used to determine the current state of an access. A0 is low for the first and high for the second access. The parallel ATA harddisk interface is mostly an usual 16 bit databus and a few address and control lines. All electronic (addressable registers) is built into the device. Hence the name Integrated Device Electronics (IDE). With the usage of the 8 to 16 bit buffer, most work to provide the PATA/IDE interface has been done. To achieve the correct timing, an Finite State Machine (FSM) is used. The FSM is part of the CPLD. Finally, to provide signal integrity, most signals are driven and terminated. To provide an 10base-T (RJ45) ethernet interface, a crystal logic CS8900a is used in conjunction with an ethernet transceiver. Although the CS8900a provides an 8 bit mode it is accessed with 16 bit width since the 8 bit mode does not support interrupts. As this device has been developed for the Intel bus which is little endian, the databus has been swapped to connect to the big endian MC68008. Thus the data lines D0-D7 coming from the 8 to 16 bit buffer are connected to data lines SD8-SD15 of the CS8900a and vice versa. The real time clock (RTC) is battery backed up, but unfortunately, the design is not clean enough. The datasheet claims an voltage monitor to prevent accesses by accident when the computer is switched on or off. The voltage monitor was replaced by just two diodes (D1 and D2). These prevent current flow from the battery into the system when switched off and charging the battery when switched on. Sometimes switching off and on changes parts of the time and date. 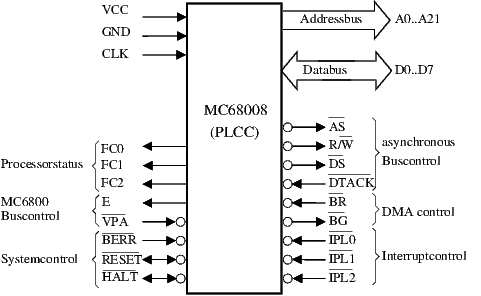 As mentioned in the chapter about the CPU, the MC68008 supports different interrupt level. The level is encoded with three pins *IPL0-IPL2. Interrupt level The MC68008 supports two types of determining the interrupt vector. Autovector and non autovector interrupts. By implementing non autovector interrupts, the interrupting device provides its own interrupt vector within an acknowledge cycle. Kiwi uses the autovector mode. This mode hard ties every interrupt level to exact one vector. If an interrupt level is shared, the source has to be determined within the service routine. 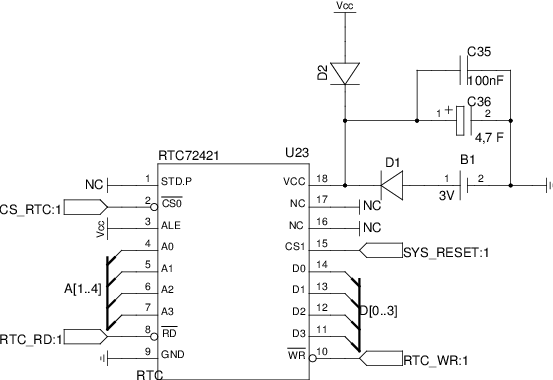 A Xilinx XC95108 CPLD is used to avoid a lot TTL logic. The built in functions are divided into following groups. VHDL is used to describe each module. E.g. the following VHDL snippets show how the next state is determined (process getnextstate) and how the FSM switches into it (process setstate). Actually it is a part of the DRAM controller module.